For high-speed rail transport in China generally, see High-speed rail in China. China Railway High-speed (CRH) is a high-speed rail service operated by China Railway. The introduction of CRH series was a major part of the sixth national railway speedup, implemented on April 18, 2007. By the end of 2018, China Railway High-speed provided service to 33 of the country's 34 provincial-level administrative divisions and operated over 29,000 km (18,000 mi) passenger tracks in length, accounting for about two-thirds of the world's high-speed rail tracks in commercial service. It is the world's most extensively used railway service, with 1.713 billion trips delivered in 2017 bringing the total cumulative number of trips to 7 billion. Over 1000 sets of rolling stock are operated under the CRH brand including Hexie CRH1/2A/5 that are designed to have a maximum speed of 250 km/h (160 mph), and CRH2C/3 have a maximum speed of 350 km/h (220 mph). The indigenous designed CRH380A have a maximum test speed of 416.6 km/h (258.9 mph) with commercial operation speed of 350 km/h. The fastest train set, CRH380BL, attained a maximum test speed of 487.3 km/h (302.8 mph). In 2017, the China Standardized EMU brand including CR400AF/BF joined China Railway High-speed and are designated as Fuxing together with letters CR (China Railway). With a gradual plan, the CR brand is going to replace the current CRH brand in service. Depending on their speed, there are 3 categories of high speed trains, G,D and C (G being the fastest at 350 kmph, D having a speed of 250 kmph and C having a speed of 200 kmph). High-speed rail services were first introduced in 2007 operating with CRH rolling stock. Those run on existing lines that have been upgraded to speeds of up to 250 km/h (160 mph) and on newer dedicated high-speed track rated up to 350 km/h (220 mph). The following table lists the frequency of CRH service on 14 HSR lines (as of February, 2011). In some cases, CRH trains must still share the HSR lines with slower, non-high-speed trains, which are listed in the table. Note China's first HSR, the Qinshen PDL service as part of the Jingha Railway. A CRH2C, possibly a sleeper train, on the Longhai Railway outside of city walls of Xi'an. As of September 2010, there were 2,876 kilometres (1,787 mi) of upgraded conventional railways in China that can accommodate trains running speeds of 200 to 250 km/h. Over time with the completion of the national high-speed passenger-dedicated rail network, more CRH service will shift from these lines to the high-speed dedicated lines. The table below lists the upgraded conventional railways that run CRH high-speed trains every day. A CRH2E high-speed overnight sleeper in 2017. Unlike the "conventional" (non-CRH trains), which run round the clock, most high-speed rail lines operations shut down each night. (See e.g. schedules for Shanghai Hongqiao Railway Station; as of mid-December 2012, the first train of the day to leave the station is the 06:33 train to Wuhan, and the last one is the 21:10 train to Nanjing, which arrives there before 23:00.). While there are several sleeper EMU trainsets (abbreviated 动卧, dongwo) in existence running on the upgraded rail or high-speed lines, the overnight service is mostly limited to a few night trains between Shanghai and Beijing. With the schedule change planned for 2012-12-21, some of these trainsets will be re-purposed to also provide overnight high-speed service between Shanghai and Xi'an North. Elsewhere, the fastest overnight rail service available is provided by fairly fast, but "conventional" (not CRH) Z-series trains. Some of them also use certain sections of the high-speed rail network; e.g., the planned Shanghai-Chengdu train Z121/2/3/4 will use the Huhanrong PDL from Nanjing to Wuhan. In the 2014 Chunyun season, overnight HSR trains first ran on Beijing-Guangzhou (Jingguang) and other lines. In November 2016, CRRC Changchun unveiled CRH5E bullet train carriages with sleeper berths. Made in the CRRC factory in Changchun and nicknamed Panda, they are capable of running at 250 km/h, operate at -40 degrees Celsius, have wifi hubs and contain sleeper berths that fold into seats during the day. In 2017, CRRC unveiled a high speed train with double decked sleeper berths classed as the CRH2E series high speed rail train. Since CRH2E-2463, brand new CRH2E rolls off the production line in the beginning of 2017. The layout inside CRH2E-2463 is different from the previous ones. Its corridor dominates the centre of the sleeping car, while on either side the bunk beds are fixed parallel. Each bed has a layout similar to airplane first class, and passengers are no longer sharing the room. Instead, each passenger has separate compartment looks like a capsule. Each capsule comes with independent tables, outlets, lamps, hangers and curtains. The hull of the train is redesigned so the noise level is lower compare to previous models. Chinese designed CR400AF departing from Beijing South Railway Station. China Railway High-speed runs different electric multiple unit trainsets, the name Hexie (simplified Chinese: 和谐号; traditional Chinese: 和諧號; pinyin: Héxié Hào; literally: 'Harmony') is for designs which are imported from other nations and designated CRH-1 through CRH-5 and CRH380A(L), CRH380B(L), and CRH380C(L). CRH trainsets are intended to provide fast and convenient travel between cities. Some of the Hexie Hao train sets are manufactured locally through technology transfer, a key requirement for China. The signalling, track and support structures, control software, and station design are developed domestically with foreign elements as well. By 2010, the truck system as a whole is predominantly Chinese. China currently holds many new patents related to the internal components of these trains, re-designed in China to allow the trains to run at higher speeds than the foreign designs allowed. However, these patents are only valid within China, and as such hold no international power. The weakness on intellectual property of Hexie Hao causes obstruction for China to export its high-speed rail related product, which leads to the development of the completely redesigned train brand called Fuxing (simplified Chinese: 复兴号; traditional Chinese: 復興號; pinyin: Fùxīng Hào; literally: 'Rejuvenation') that based on indigenous technologies. CRH2A: In 2006, China unveiled CRH2, a modified version of the Japanese Shinkansen E2-1000 series. An order for 60 8-car sets had been placed in 2004, with the first few built in Japan, the rest produced by Sifang Locomotive and Rolling Stock in China. CRH1A, B,E, CRH2A, B,E, and CRH5A are designed for a maximum operating speed (MOR) of 200 km/h and can reach up to 250 km/h. CRH3C and CRH2C designs have an MOR of 300 km/h, and can reach up to 350 km/h, with a top testing speed more than 380 km/h. However, in practical terms, issues such as maintenance costs, comfort, and safety make the maximum speed of more than 380 km/h impractical and remain limiting factors. CR400AF: Maximum operating speed of 400 km/h; Developed by CRRC Qingdao Sifang, guided by Chinese EMU standard. CR400BF: Maximum operating speed of 400 km/h; Developed by CRRC Changchun Railway Vehicles, guided by Chinese EMU standard. Based on data published by Sinolink Securities; some small changes were made according to the most recent news. ^1 All CRH380B and CRH380C units to be delivered before 2012. ^2 All CRH380D units to be delivered before 2014. Annual HSR ridership is highest in the world and has ramped up very quickly, as self-reported by rail authorities. China is the third country, after Japan and France, to have one billion cumulative HSR passengers. Ridership in 2018 is above 2 billion per year. Nevertheless, a breakdown for lines and services is not available, system ridership may be overestimated given transfer connections within the system may be counted as new passengers each time. Before the introduction of foreign technology, China conducted independent attempts to domestically develop high-speed rail technology. Some notable results included the China Star, but domestic Chinese companies lacked the technology and expertise of foreign companies, and the research process consumed a large amount of time. People's Republic of China Ministry of Railways spokesman Zhang Shuguang stated that due to historical reasons, China's overall railway technology and equipment is similar to that of developed countries' rail systems in the 1970s; high-speed rolling stock development is still in its infancy stage. If using only their own resources and expertise, the country might need a decade or longer to catch up with developed nations. In 2004, the Chinese State Council and the Ministry of Railways defined a modern railway technology and equipment policy as "the introduction of advanced technology, the joint design and production, to build China brand". The realization of the railway "leapfrog development" is the key task required to develop and utilize the technology required for high-speed trains (higher than 200 km/h or 124 mph per hour). On April 9, 2004, the Chinese government held a conference on modern railway equipment and rolling stock, in which they drafted the current Chinese plan to modernize the country's railway infrastructure with advanced technologies. A comprehensive transfer of technology to Chinese enterprises (especially in systems integration, AC drive and other core technologies) was necessary to allow domestic enterprises to master the core technology. While foreign partners might provide technical services and training, the Chinese companies must ultimately be able to function without the partnership. Railway equipment manufacturers in China were free to choose foreign partners, but foreign firms must pre-bid and sign the technology transfer agreement with China's domestic manufacturers, so the Chinese rolling stock manufacturers could comprehensively and systematically learn advanced foreign technology. These three consortiums were each given three, three, and one twenty order packages respectively. Germany's Siemens, as a result of an expensive technology bid — the prototype vehicle cost was 350 million yuan each column, technology transfer fee 390 million euros — did not get any orders in the first round. EMU tendered 22.7 billion yuan for technology transfer payments in the first payment, accounting for 51 per cent of the amount of the tender. In November 2005, the Chinese Ministry of Railways and Siemens reached an agreement, and Siemens in a joint venture with Changchun Railway Vehicles and Tangshan Railway Vehicle (both owned by CNR) was awarded sixty 300 km/h (186 mph) high-speed train orders. 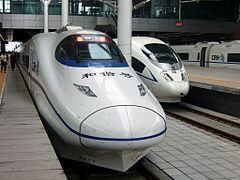 The introduction of high-speed trains, a foreign advanced technology, was required in order to implement China's "Long-term Scientific and Technological Development (2006–2020)". The core technology innovations necessary for a high-speed rail system to meet the needs of China's railway development resulted in the Ministry of Science and Ministry of Railways signing the "independent innovation of Chinese high-speed train cooperation agreement Joint Action Plan" on February 26, 2008. Academicians and researchers from CAS, Tsinghua University, Zhejiang University, Southwest Jiaotong University, and Beijing Jiaotong University have committed to working together on basic research into improving China's scientific and industrial resources into developing a high-speed train system. The Chinese Ministry of Science has invested nearly 10 billion yuan in this science and technology plan, which is by far the largest investment program. The project has brought together a total of 25 universities, 11 research institutes, and national laboratories, and 51 engineering research centers. The Ministry of Science hopes to develop basic research sufficient to produce key technologies necessary to develop trains capable of 500 km/h (310 mph) through the "863 Project" and "973 Project". On 2009-07-27, Chinese Ministry deputy chief engineer Zhang Shuguang stated that America, Saudi Arabia and Brazil are interested in Chinese high-speed railway technology. July 28. The Federal Railroad Administration and the US government are negotiating on the introduction of Chinese railway technology. On 14 October 2009, Prime minister of Russia Vladimir Putin and the Russian Railroad Administration signed an Organizing and developing railway in Russia memo with Ministry of Railways of China, planning to build a high-speed railway from Vladivostok to Khabarovsk. On 23 July 2011 at approximately 20:00 CST, two high-speed trains travelling on the Yongtaiwen railway line No. D301 and No. D3115 bound for Fuzhou collided on a viaduct near Wenzhou, Zhejiang, leading to 40 deaths and 191 injuries. Both trains were on the same rail track, headed in the same direction. D3115 ground to a halt in front of D301 due to a loss of electric power caused by lightning striking a viaduct near the Ou River. Signalling systems purportedly failed, and D301 rear-ended the first train, sending four carriages off the viaduct. ^ 国产高铁列车中华之星夭折记:部长更迭改变命运 (in Chinese). people.com.cn. August 9, 2011. Retrieved June 29, 2014. ^ 全国高铁运营里程已超过2.2万公里 (in Chinese). January 3, 2017. ^ "China to start construction on 35 railway projects: report". Xinhua. February 19, 2017. ^ "China's railway network spans 131,000 km". www.ecns.cn. Retrieved February 18, 2019. ^ "China Bullet Train Tickets, High Speed Rail Booking Online". www.travelchinaguide.com. Retrieved February 18, 2019. ^ Ma Yujia (马玉佳). "New high-speed trains on drawing board- China.org.cn". www.china.org.cn. Retrieved November 13, 2017. ^ chinanews. 2017年中国铁路投资8010亿元 投产新线3038公里-中新网. www.chinanews.com. Retrieved January 13, 2018. ^ 中国标准动车组命名"复兴号". Xinhua News Agency. June 25, 2017. ^ Lu Bingyang (路炳阳) (June 25, 2017). 中国标动明日京沪高铁首发 命名复兴号. Caixin Companies. Retrieved July 4, 2017. ^ "China launches its first self-developed bullet train 'Fuxing' as Beijing eyes global high-speed rail market". Daily Mail. July 26, 2017. ^ 大陸高鐵新紀元 「復興號」將取代「和諧號」. 鉅亨網. June 27, 2017. Retrieved July 4, 2017. ^ "How to choose between train types". www.travelchinaguide.com Also see China Highlights. Retrieved December 26, 2018. ^ a b 123查/中国火车时刻表在线查询 (in Chinese). ^ 铁路客户服务中心. 12306.cn. Retrieved August 17, 2011. ^ "Train No.G1001 timetable". Archived from the original on October 3, 2012. ^ 京广高速铁路武广段开通运行. society.people.com.cn (in Chinese). December 26, 2009. ^ "Train No.G7301 timetable". Archived from the original on July 14, 2011. ^ a b 沪宁沪杭增开4.5对动车. Archived from the original on July 22, 2011. ^ 沪杭高铁引领世界. www.chnrailway.com (in Chinese). ^ 提示信息 铁路在线论坛. Bbs.ourail.com. Retrieved October 17, 2015. ^ 国庆长假进入尾声 南京铁路往南通徐州增1趟临客 – 中国徐州网. Cnxz.com.cn. October 6, 2010. Retrieved August 14, 2011. ^ 京津城际加车五一每天百对. Archived from the original on April 29, 2011. ^ 京津城际动车组列车将统一车型 (in Chinese). Archived from the original on April 7, 2013. ^ 郑西客运专线春运试运营 西安到郑州仅2小时(图)-郑西客专-旅游. Travel.hsw.cn. January 18, 2010. Retrieved August 14, 2011. ^ 71调图甬台温所有交路车型情况 (in Chinese). June 23, 2010. ^ a b TOP 10 FASTEST TRAINS – Powered by HENCHMAN!. ask-entertainment.blogspot.com. Retrieved March 23, 2019. ^ 石太客运专线正式通车 全程省时近4小时(图)_国内图片_新闻_腾讯网. News.qq.com. Retrieved August 14, 2011. ^ 昌九城际铁路动车组车型揭晓(组图)_新闻中心_新浪网. News.sina.com.cn. Retrieved August 14, 2011. ^ 曾经胶济线上的CRH2们 – 我的铁路影集 – 长江铁路网论坛|和谐号|CRH|HXD – Powered by Discuz!. Railwayfan.net. Archived from the original on August 12, 2011. Retrieved August 14, 2011. ^ 成都铁路局最新CRH动车组详细配属情况 (in Chinese). July 17, 2010. ^ "Train No. D5211 timetable". ^ "Train No. D39 timetable". ^ "Train No. D6619 timetable". ^ "Train No. D342 timetable". ^ "Train No. D131 timetable". ^ "Train No. D125 timetable". ^ "China develops bullet train with fold-up beds". China Daily. Xinhua. November 14, 2016. Retrieved November 15, 2016. ^ email@gmail.com, name,. 我国首列时速250公里纵向卧铺动车组下线. www.guancha.cn (in Chinese). Retrieved July 2, 2017. ^ 中国第一款纵向布局"双层"卧铺动车组下线 - 行业 - 人民铁道网 - 中国官方铁路门户. www.peoplerail.com. Retrieved July 2, 2017. ^ "China's New High-Speed Sleeper Train is Literally a 'Moving Hotel'". nextshark. July 2017. ^ a b Shirouzu, Norihiko (November 17, 2010). "Train Makers Rail Against China's High-Speed Designs". The Wall Street Journal. Retrieved December 26, 2012. ^ Wines, Michael; Bradsher, Keith (February 17, 2011). "China Rail Chief's Firing Hints at Trouble". The New York Times. Retrieved December 27, 2012. Many multinational companies also resent China for tweaking foreign designs and building the equipment itself rather than importing it. ^ Johnson, Ian (June 13, 2011). "High-Speed Trains in China to Run Slower, Ministry Says". The New York Times. Retrieved December 27, 2012. In the past few months, some foreign companies that sold China its high-speed technology said the trains were not designed to operate at 215 miles per hour. The ministry said that Chinese engineers had improved on the foreign technology and that the trains were safe at the higher speeds. ^ Xin, Dingding (June 28, 2011). "Full steam ahead for high-speed rail patents overseas". China Daily. Retrieved December 27, 2012. ^ "High speed trainsets take shape". Railway Gazette International. August 1, 2005. Archived from the original on August 9, 2011. Retrieved August 4, 2011. ^ "China's high speed fleet expands steadily". Railway Gazette International. August 1, 2007. Archived from the original on June 16, 2011. Retrieved August 4, 2011. ^ 法中企业握手互利共赢. news.xinhuanet.com (in Chinese). October 25, 2004. ^ 2004年10月12日，BSP与铁道部及广州铁路（集团）签订了20列（160辆）EMU动车组. www.bsp.cn (in Chinese). January 12, 2006. Archived from the original on July 7, 2011. ^ a b c d CRH2型动车组详细资料及分类. news.chineserailways.com (in Chinese). December 14, 2009. Archived from the original on August 23, 2011. ^ 庞巴迪：又获铁道部动车组大订单. info.traffic.hc360.com (in Chinese). June 10, 2005. ^ 西门子专家进驻唐山机车车辆厂. hebei.moform.gov.cn (in Chinese). August 15, 2006. Archived from the original on August 17, 2011. ^ BSP公司在北京签订40列EMU动车组订单. www.bsp.cn (in Chinese). November 2, 2007. Archived from the original on July 7, 2011. ^ 招商证券-中国南车-601766-动车交付高峰来临，业绩逐季增... www.docin.com (in Chinese). ^ 公司与北京铁路局签订了30列CRH5型动车组采购合同. www.cccar.com.cnom (in Chinese). Archived from the original on July 17, 2011. ^ 唐车公司拿到京沪高铁动车组大订单 总金额392亿. info.china.alibaba.com (in Chinese). March 17, 2009. ^ a b 中国南车：中标巨额合同 增厚公司业绩. www.guosen.com.cn (in Chinese). September 30, 2009. ^ Ltd, DVV Media International. "Zefiro 250NG included in revised high speed train contract". ^ 招商证券-中国北车-601299-动车组第三批高毛利率订单将陆续交付. www.docin.com (in Chinese). ^ 中国南车获国内首个城际列车项目订单 总值23.46亿人民币 (in Chinese). ^ "Bombardier Sifang Awarded Fourth Contract for 40 Additional CRH1 High-Speed Trains in China". cn.bombardier.com. July 16, 2010. Archived from the original on August 13, 2011. Retrieved August 4, 2011. ^ 中国南车：再中标动车组订单、未来高增长确定::全景证券频道. www.p5w.net (in Chinese). September 30, 2010. ^ "news.xinmin.cn/rollnews/2010/10/13/7194620.html". news.xinmin.cn (in Chinese). October 13, 2010. ^ 中国南车研究报告：国金证券-中国南车-601766-通往春天的铁路设备龙头. docin.com (in Chinese). ^ 国金证券-中国北车-601299-动车交付单价已触底，毛利率回升可期. docin.com (in Chinese). ^ 世界银行：中国高铁作为出行新选择快速发展. www.shihang.org. December 19, 2014. ^ 把脉中国高铁发展计划：高铁运行头三年 (PDF). worldbank.org. February 1, 2012. ^ F_404. "High-speed rail construction not suspended - People's Daily Online". en.people.cn. ^ 中国高速铁路: 运量分析 (PDF) (in Chinese). World Bank. December 2014. Archived from the original (PDF) on December 21, 2014. Retrieved October 17, 2015. ^ 铁路2014年投资8088亿元 超额完成全年计划-财经-人民网. people.com.cn (in Chinese). January 30, 2015. Retrieved October 17, 2015. ^ "China Railway sets out 2017 targets - International Railway Journal". January 4, 2017. ^ "China Exclusive: Five bln trips made on China's bullet trains". Xinhua News. July 21, 2016. ^ chinanews. 2017年中国铁路投资8010亿元 投产新线3038公里-中新网. www.chinanews.com. ^ "Zhang Shuguang: railway technical equipment of modern achievement has been to benefit the masses". Chinese Government Network. April 29, 2007. Retrieved May 28, 2010. ^ "China's "insist" Core Technology High Speed Rail: 6 years ago, finally got the reward persistence". Oriental Morning Post. March 18, 2010. Archived from the original on March 22, 2010. Retrieved September 9, 2010. ^ a b "sixth speed railway will be 200 kilometers per hour of the introduction of locomotives". Xinhua. September 4, 2004. Retrieved September 20, 2010. ^ Zhang Chunli (September 2, 2008). "China's road to the introduction of High Speed Rail: 1.5 billion foreigners cut off overnight – Deputy Ministry of Railways engineer Zhang Shuguang Group of Chinese High Speed road of independent innovation". People's. Retrieved May 28, 2010. ^ "China's high-speed railway construction generous: print media, technology absorption of the four countries envy". Xinhua. February 4, 2008. Archived from the original on September 2, 2010. Retrieved May 28, 2010. ^ "Science and Technology, Ministry of Railways jointly signed the "China's high-speed train innovation partnership joint action plan "". Science and Technology Portal. February 27, 2008. Retrieved May 28, 2010. ^ "Ministry of Railways, Ministry of Science and the United deepened over 350 km per hour high speed train innovation". China Railway. February 29, 2008. Retrieved May 28, 2010. ^ "High Speed Rail promote high-tech industries in China great development". "Science and Technology Daily". September 6, 2010. Archived from the original on July 23, 2011. Retrieved September 28, 2010. ^ "Media report America may import our rail way technology". Sina net. July 30, 2009. Archived from the original on April 11, 2013. Retrieved May 28, 2010. ^ "China will help Russia build railways". Phoenix net. October 14, 2009. Retrieved July 11, 2010. ^ Krishnan, Ananth (July 24, 2011). "China bullet train collision triggers safety debate". The Hindu. Chennai, India. Shanghai-Beijing route to test bullet train. China Daily. January 16, 2007. Wikimedia Commons has media related to China Railway High-speed. This page was last edited on 20 April 2019, at 12:17 (UTC).